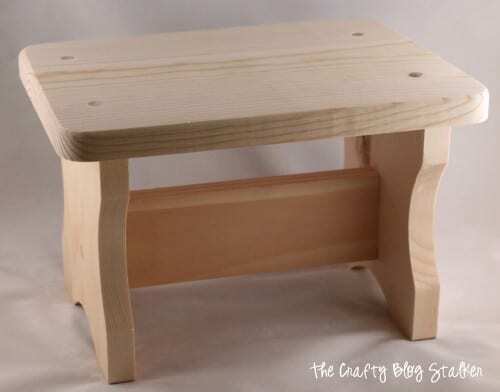 Learn how to make a DIY wood foot rest and sit comfy at your office desk. An easy DIY craft tutorial idea that can be made in under 1 hour. Do you sit at a desk for long periods of time? I am always at my desk and I find it much more comfortable to have my feet up on something. Anything will do, right now I have an old Amazon box that works most of the time, but if my feet lay on it just wrong the whole thing collapses. That means it must be time to get a REAL foot rest, and of course I want to make it cute! According to the staining medium, mix with the acrylic paint. Paint only the base and the underside of the top with the mixture. As you paint, take a rag and wipe off the paint like you would stain and you will end up with an awesome effect. They yellow is vibrant but you can still see the grain of the wood. Measure the top of the footrest. Cut the fabric so it is about 6 inches wider and longer than the top, and cut the batting so it is 2 inches wider and longer. Layer with the fabric facing down, the batting and the stool on top. 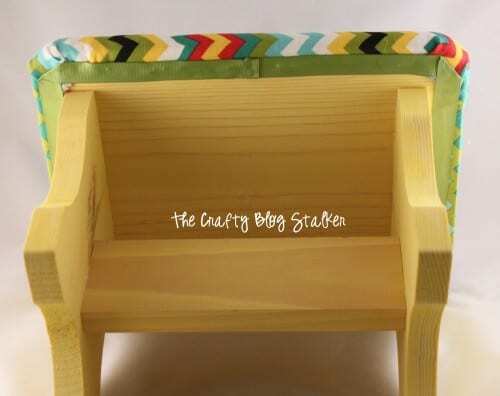 Use a heavy duty staple gun and pulling the fabric tight around the foot rest and staple in place. I stapled the center of each side first, pulling tight and moving around from there. If the underside is a little too messy for your liking you can hot glue a strip of ribbon over the staples and the ends of the fabric to give it a cleaner look. This little foot rest has really come in handy. It makes sitting at my desk so much more comfortable! 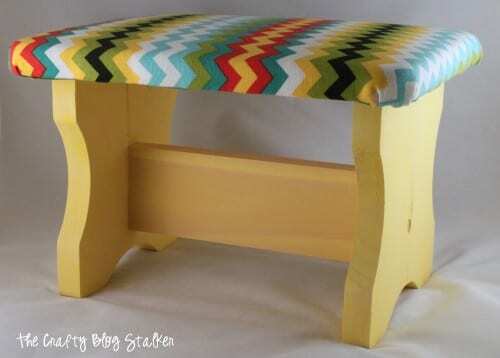 What colors or fabric pattern would you use on your foot rest? Share and leave a comment below! If you liked this post you can find more DIY ideas in my Home Decor Gallery. What a cute little stool! You did a great job : ) Saw you on the Shabby Nest and came to say hello! This is gorgeous! So so cool! Makes me want to get crafty! I’m visiting from the Creative Monday Hop, and I’m now following on GFC and Facebook. I’d love to have you visit my blog! I want it Katie…. PLEASE!!!!! That’s really cute! I love this idea of adding the padded top. I was thinking about getting a little stool for my son for the bathroom and this is a really great idea! This looks great! 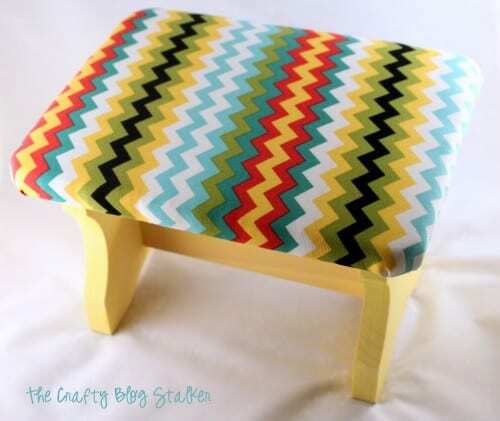 I love the chevron pattern, and I love the bright colors! Thanks for linking up with me for Friday Favorites. I’m featuring you this week. This is soo stinking adorable! 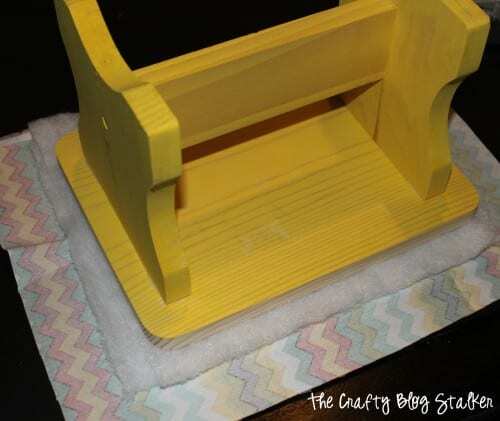 I just love the fabric and color pattern and of course what a clever way to make an inexpensive foot stool! OMG I love the fabric you chose! I see those stools at the craft store all the time, now I’ll have to buy one and make use your tutorial to make it look awesome. Thanks for sharing at Hookin On Hump Day! So awesome! Loved and pinned. Thank you for sharing at MightyCrafty Mondays! Love chevron, and love the happy colors! I will be featuring it on my blog tomorrow! You did a really nice job finishing this stool. Even the underside is pretty. This is ADOREBLE!! I am in love with all the colors, so bright and fun. Thank you for sharing with us at Link It Up Thursday. I love this idea. I used to have a little wooden stool in my classroom and it “disappeared” last year. I’m going to ask a student to make me a new one so I can finish it like this. I love having my feet up when I’m sitting too. Nice! I love the tip about the stain medium–I had no idea there was any such thing!